The well-known Green Mask pictograph located in Sheiks Canyon, just off of Grand Gulch, is a haunting face painted high up on the alcove wall. 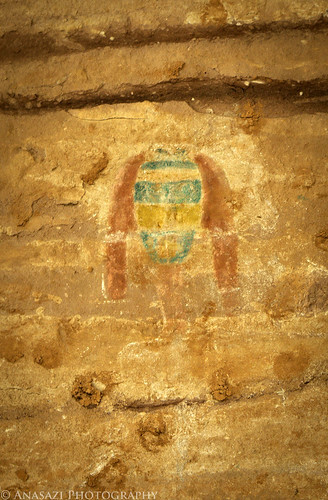 I have read that this may possibly represent a ritual object made from a whole face and hair scalp of a human head because such an object, painted in a similar manner, was excavated from a Basketmaker burial in northern Arizona. I wish I had brought my long lens along with me when I hiked there since it was located very high on the back alcove wall.